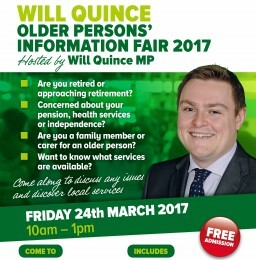 Update: On Friday (24th March) Thompson Smith and Puxon (TSP) exhibited at the Older Persons’ Information Fair organised by MP Will Quince. The event was a great success with exhibitors representing an excellent range of services for older people and those who care for older people. The TSP Wills and Estates team were on hand to answer questions and to give advice on our Lifetime Planning services, and held two ‘Planning Ahead’ workshops during the morning, covering the following topics; Wills vs Intestacy, Inheritance Tax Planning, Funding Future Care and Powers of Attorney vs Court of Protection. Visitors to our stand were invited to enter our free prize draw to win a Lindt Easter egg and the winner was Mrs J Free of Stanway. 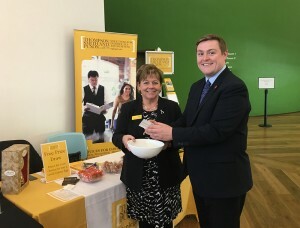 Fiona Ashworth, Head of the TSP Wills and Estates team, is pictured with Colchester MP Will Quince, drawing the winner. …then this event may be for you. Entry is free so why not come along and find out more about the general services that are available for older people and those who care for older people. Thompson Smith and Puxon (TSP) will be exhibiting at the fair and members of our Wills and Estates team will be available to answer any questions you or your family may have on Later Life Planning and to discuss the variety of services TSP offer. Team Leader, Solicitor, Fiona Ashworth is a Member of Solicitors for the Elderly, an independent national organisation of legal professionals who provide specialist legal advice for older and vulnerable people, their families and carers. Fiona will be joined by colleagues Sarah White, Associate Solicitor, Aileen Hirst, Solicitor and Robert Ashworth, Solicitor, and will talk briefly and take questions on each of the above topics.